The Berdmore's Loach is beautiful large loach, but has a rather quarrelsome nature! The Berdmore's Loach Syncrossus berdmorei is a good sized fish, reaching between 6 to 8 inches (15 - 20 cm) long in the aquarium. Once it reaches maturity and its full coloring has developed it makes an awesome addition to a large aquarium with other good sized, like-tempered tank mates. The adult Berdsmore's is very attractive. It has a golden brown color overall with strong clear green vertical green banding and elongated spots running horizontally along the body and onto the tail fin. There is also a strong red coloring in the fins and tail. It is known by several common names including Blyth's Loach, Burmese Peppered Firetail Botia, Redfin Tiger Loach, Berdmore's Tiger Loach, and Tiger Loach. As a juvenile this species is quite similar in to its close relative the Chameleon loach Syncrossus beauforti (previously Botia beauforti) in both color and body. 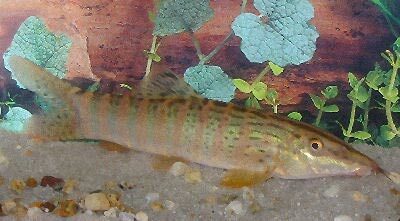 But as adults only the Berdmore's Loach retains the green banding, and it grows much larger than the S. beauforti. When falling in love with the exquisite beauty of the Berdmore's Loach be ready for its rather quarrelsome nature. It could be okay with more robust tank mates, but it may want to be the star of its own aquarium and not tolerate any tank mates. The Berdmore's Loach can range between a good community fish to semi-aggressive fish. Each fish will have its own degree of aggressive behavior.They are often intolerant of other loaches even their own species. Plan on keeping only one in the aquarium unless there are plenty of caves or retreats available for each to establish its own territory. Don't keep them with any timid fish, rather keep them in a large aquarium with other more robust tank mates. As they can grow quite large they will need plenty of room for swimming. It is also recommended that they be kept in an aquarium with good clear water. They have two hinged spines beneath the eyes that they use for fighting. Be careful when moving them as these spines can easily get caught in a net. The Berdmore's Loach Syncrossus berdmorei (previously Botia beauforti) was described by Blyth in 1860. It is found in Asia from the Chindwin basin of India, in Myanmar from the Mandalay area and Shweli River, and in central Thailand. Other common names they are known by include Blyth's Loach, Burmese Peppered Firetail Botia, Redfin Tiger Loach, Berdmore's Tiger Loach, and Tiger Loach. This species is listed on the IUCN Red List as near threatened (NT). Syncrossus berdmorei is valued as an ornamental fish and there is ongoing degradation of it natural habitat. Although it is widely spread, these factors inferred that it may be declining in the wild. Hence it is assessed as Near Threatened, but with the recognition that more research about the biology of this species is needed as well as identifying potential threats. The Ataran River is one of the primary water systems for this loach. They inhabit clear mountain streams as well as medium to large sized rivers. It has both slow and fast flowing sections and has sandy and gravel substrates that are littered with driftwood and leaves. There is some aquatic plant life in the slow-flowing sections of the river. The waters are clear and very well oxygenated. The many other rivers that they inhabit are basically the same environment. This loach is found mainly in areas where there is subdued light, often near large rocks and trees that have fallen in the water. It will burrow into the sand or dig holes under the rocks. During the high water seasons it will move into flooded forest areas. It feeds primarily on mollusks and crustaceans. Social Grouping: Groups - Normally loose groups. The Berdmore's Loach or Blyth's Loach reaches a good size in the aquarium, normally about 6 - 8" (15 - 20 cm) in length. In the wild they are even bigger attaining a length up to about 10" (25 cm). They generally have a life span of about 5 - 8 years, though it is believed they could live up to 12 years. The adult coloration is quite striking. It has a brownish gold background color with strong clear vertical green banding. This is topped with elongated spots running horizontally along the body and onto the tail fin. There is also a strong red coloring in the fins and tail. Size of fish - inches: 10.0 inches (25.40 cm) - These fish are can reach about 6 - 8" (15 - 20 cm) in the aquarium, but in the wild these fish can get up to 10" (25 cm). Lifespan: 12 years - Their lifespan is generally about 5 - 8 years though it is thought they could live up to 12. This loach can be hardy under the right conditions. They are not recommended for beginners because of their need for pristine water and having small body scales. Reduced scales makes them more prone to disease and very sensitive to medications used to treat disease. Experience in treating scaleless fish is very important to be able to give your loach a healthy and long life. Do not try to introduce these fish into biologically immature tanks. In nature the Berdmore's loach is primarily carnivorous but will also eat vegetable matter if available, normally eating soft-leaved aquatic plants. Since they are omnivorous, they will generally eat all kinds of live and frozen foods, sinking pellets, and a bit of algae in a sinking tablet. These loaches will also prey on snails in your tank. They are not very fussy eaters and will eat a variety of foods consisting of high quality dried foods, live or frozen bloodworms, tubifex, and artemia as just a few examples. They will also feed on fresh fruits and vegetables like cucumbers, melon, blanched spinach, or zucchini. Because they spend almost all their time on the bottom of the aquarium sinking food is necessary, but don't be surprised if your loach rises to mid-tank at feeding time. Diet Type: Omnivore - In nature their primary diet is meaty foods, but will eat aquatic plants if available. In the aquarium will turn more to an omnivorous diet. The most important thing for these loaches is that they always have clean and well-oxygenated water. Frequent water changes of about 30% a week are needed. With your weekly water change make sure to vacuum the gravel to remove all excess food and waste. Make sure not to remove the bio film on rocks, decor or no viewing panes of the tank. A magnet algae cleaner normally does a great job in keeping the viewing pane clear. Water Changes: Weekly - Water changes of 30% or more. The Berdmore's Loach will swim mostly on the bottom of the aquarium. This loach comes from fast moving mountain streams and rivers so need a larger sized aquarium, 30 - 35 gallons minimum for juveniles.The tank should also be long, a four foot length is ideal when young and then longer as they grow. Never introduce this loach into a biological immature setup as these fish require pristine water. They do best in a soft to medium water with subdued lighting. They need good water movement that provides plenty of oxygenation. Using an over sized external power filter will help meet that requirement. Powerheads and River manifolds can be used to create the proper current for these loaches. The substrate should consist of fine sand to allow digging without damaging it's barbels. There should be a lot of submerged boulders and branches to give this loach a very dark area to retreat. Hardness Range: 5 - 12 dGH - They do best in soft to medium water. Water Region: Bottom - These fish are bottom dwellers. They may be kept in a community aquarium with other semi-aggressive tank mates but are generally intolerant of other loaches, even their own species. It is best to keep one per aquarium unless there is lots of space and caves for each to stake out its own territory. These loaches form a social hierarchy and should be kept in groups of 5 or more if tank is big enough. 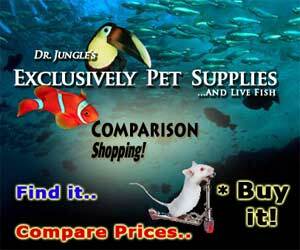 Any less and the dominant loach will act out towards any fish that is of similar shape. And if kept in pairs the dominant loach will normal attack the other and prevent it from eating. The Berdmore's Loach can be a bit belligerent and should not be kept with smaller fish. Smaller fish can easily be intimidated by its size and behavior. Slow moving, long finned fish need to be avoided as well as this loach will nip any trailing fins. Take great caution selecting other bottom dwellers as this loach can get very territorial. Same species - conspecifics: Sometimes - A pair or a group of 5 or more can be kept, but only in larger tanks. Peaceful fish (): Threat - This loach is a threat to smaller fish, long-finned fish, and territorial with other bottom dwellers. Slow Swimmers & Eaters (): Threat - It will nip fins. Shrimps, Crabs, Snails: Threat - is aggressive - This loach will feed on snails. Plants: Safe - Generally safe though it may nibble on soft leaves. Full grown females will probably have a rounder abdomen. Not much is known about the breeding habits of the Berdmore's Loach. It has not been bred in the aquarium and they are not yet bred commercially. Loaches are more susceptible to disease than other aquarium fishes. This may have to do with the faint body scales and no head scales. Take caution when introducing these fish to an established tank. The Berdmore's Loach is also very sensitive to different medications used to treat many diseases; a separate hospital tank is needed. Cold water and condition changes can also cause stress to this fish which makes them even more prone to disease. An outbreak of disease can often be limited to just one or a few fishes if you deal with it at an early stage. When keeping these sensitive types of fish, it is common to catch deteriorating water conditions and disease before other fish are affected. The best way to proactively prevent disease is to give your Berdmore's Loach the proper environment and give them a well balanced diet. The closer to their natural habitat the less stress the fish will have, making them healthier and happy. A stressed fish will is more likely to acquire disease. The Berdmore's Loach is usually available at pet stores or online. It may also be called Blyth's loach, Burmese Peppered Firetail Botia, or Redfin Tiger Loach. I have one of these little terrors. I've never seen a loach more aggresive than this one. He attacks all of my fish when they swim by him, even my convict cichlid and green terror. If he's scared, he darts away back into his little hole. He likes to snack on feeder fish, brine shrimp, and freeze-dried krill. We have had a Peppered Firetail Tiger Loach (one of these guys, just a much cooler descriptive name) for about 8 months. Though he does chase after some species when the hang out on the bottom for too long, he is perfectly content with smaller loach species and corys. We 5 zodiac loaches for a long time with him (moved them to a smaller tank and 2 got killed selecting breeding partners... though we did end up getting a huge batch of eggs, which was cool), and recently restocked with small YoYo, one sinoboria pulchra (Red-Lipped Botia, though actually has yellow lips), two golden zebra loaches, and one giant YoYo that's about 7 in. We were a little worried about aggression from the Tiger Loach (he's 6 in. ), but he really gets along with the YoYo well. Give them hiding places. And peaceful bottom dwellers. Grab some large corys and your tiger will probably stop terrorizing your fish, since corys are oblivious to tankmates. Fish like to form hierarchies, and all the space the loaches have to discover that is on the bottom. If each fish has a place to call his own, it won't be anywhere near as aggressive. I want to keep a berdmore's loach fish. Can this type of fish live in a tank without water filter and low oxygen situation? Can anyone reply me? You can keep it, but you will have to make daily 25% water changes. I originally purchased this fish to control the snail population in my planted. While he kept the snails at bay but also killed all the other fishes until I started stocking the tank with cichlids. The planted cichlid tank ain't easy but works sometimes. The Berdmore's Loach or Blyth's loach can range between a community to semi-aggressive fish. Each fish will have its own degree of aggressive behavior. Don't keep them with any timid fish, rather keep them in a large aquarium with other more robust tank mates. They are carnivores and you see other fish and they see food. When grown, the cichlids are almost as large as the loach - but how big are they now?